People usually prefer hospitals that have the best equipment and other essential infrastructure. In case of an emergency, people make call to the ambulance and admits the patient immediately to the hospital. One of the essential infrastructures that every hospital must have to carry the patient from one place to other is wheelchair and stretcher. If in case, the doctors need to conduct some surgery for the patient, they need to have anesthesia. Usually, the doctors give General Anaesthesia for the patients and the nurse will carry the equipment in Anaesthesia Trolley machines. Anesthesia is actually a medicine given to the patients at the time of operations. In order to lose the sensation of touch on their body on a temporary basis then, doctors will inject anaesthesia into the body of the patient. 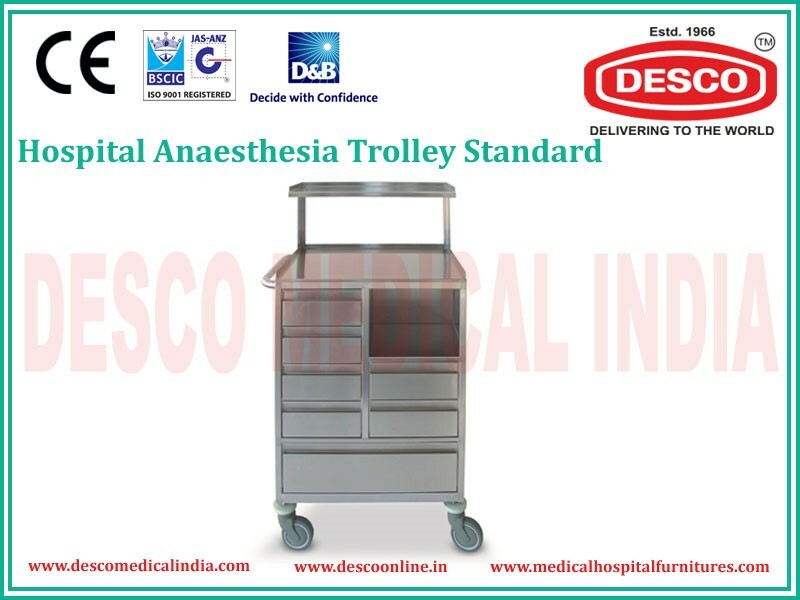 DESCO MEDICAL INDIA has numerous Hospital Anaesthesia Trolley that manufactures the best quality of trolleys for the hospitals. Check it out! Anaesthesia usually comprises of some things so as to provide relaxation for the muscle and provide the best relief for the patient. There are different types of Anaesthesia that include General, Dental, Twilight, Local and Neuraxial Blockade Anaesthesia. Sometimes, doctors give it to the patient so as to prevent the pain in them during surgery. All the essential instruments present on the Anaesthesia cart include a lot more things. Some of them include Gas Cylinder, Laryngeal tube, Medical monitor and a lot more. The Anaesthesia machine comprises of different components such as hospital oxygen, medical air and other gas. In these trolleys, you can find an integrated ventilator so as to provide proper oxygen for all the patients. Check out the types of Anaesthesia Trolleys and their usage. The standard Anaesthesia Trolley comprises of 2 compartments wherein you can place the essential things required for making anaesthesia. In one compartment, you can have a total of 4 drawers to store the things. Based on your requirement, you can purchase the standard anaesthesia trolley available in different sizes and structures. The standard anaesthesia trolleys made up of stainless steel and coated with epoxy powder. The Deluxe Anaesthesia Trolley comprises of a push handle so as to move it easily from one place to other. 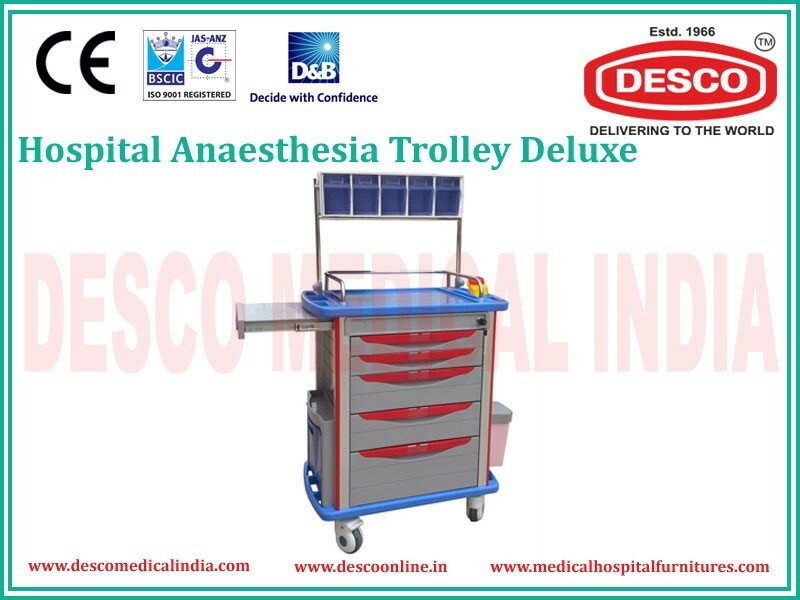 The hospital management can make use of these deluxe anaesthesia trolleys for different purposes. These trolleys are available in different colours such as red, blue, and pink and green. These Deluxe anaesthesia trolleys come with a total lock key system. The size of these trolleys will differ based on the requirement of the hospital. Every drawer in these trolleys will have an ABS basket will a well-organised divider.